Zeiders American Dream Theater is a relatively new addition to the arts scene in Virginia Beach and the greater Hampton Roads area. It is a professional not-for-profit theater that believes creativity and creative experiences are fundamental to an individual’s and community’s growth and development. Zeiders came to me wanting to move from a locally managed site to an online content management system. I designed and developed their site for WordPress. The challenge for this project was in managing how and where shows would display on the site. 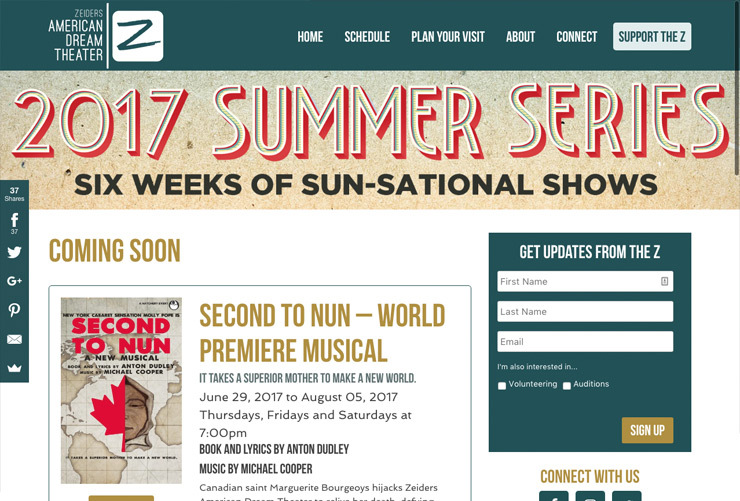 Unlike other theaters I’ve worked with, Zeiders doesn’t have set seasons and shows and events run for various lengths of time. I developed this site to allow site administrators to add shows as a custom post type, including information on when a show starts and ends. The site is programmed to check these dates and automatically display in appropriate places based on these dates. Do you have a project I might be a good fit to help you accomplish?